What is an Emergency Alarm Dialler and how does it work? An emergency alarm dialer is an electronic piece of equipment that has various sensors, probes and pieces of equipment wired into its alarm contacts. 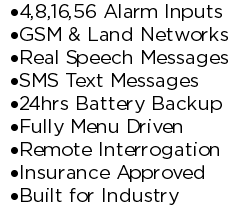 When one of those contacts changes state it instantly communicates that change to the people who have been programmed into it.Alarm diallers are primarily used in critical situations where human/animal lives, large sums of money or time could be wasted if a piece of equipment or process failed.There are various types and grades of emergency alarm dialler available from cheap domestic units for home security systems all the way to hardened industrial units. 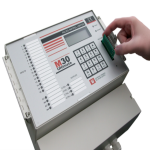 Our M30 is an industrial “made for industry” emergency alarm dialer designed for manufacturing plants, pharmaceutical units, horticulture, water process management, power generation, livestock protection or anywhere critical equipment or processes need to be monitored. The M30 is in use around the world by such companies as the BBC, Heathrow London Airport and FujiFilm. 4,8,16 & 56 individual inputs. GSM or PSTN phone line connections. For more information on our emergency alarm dialler, help or pricing please contact us or visit our standard features or auto dialler FAQs pages.